Australia 3-362 (Shaun Marsh 151, Aaron Finch 148, Shane Watson 37, Iain Wardlaw 2-69) beat Scotland 162 (Matt Machan 39, Majid Haq 25, Mitchell Johnson 4-36, James Faulkner 2-32) by 200 runs. The Kangaroos hammered 362 runs after losing just three wickets in the allocated 50 overs and the innings of Scotland was squeezed for just 162 runs with 37 balls to spare. The only One Day International between the two teams was played on Tuesday, September 3, 2013, at Grange Cricket Club Ground, Raeburn Place, Edinburgh. Earlier, Preston Mommsen, the skipper of Scotland, won the toss and offered the batting to the Kangaroos. Aaron Finch along with Shaun Marsh opened the innings for the visitors in a slow manner by scoring just 21 runs in the first seven overs. Finch started off with three back to back fours in the next one and he survived a stumping chance at 24 in the 11th over. The boundaries started flowing and the batsmen added 13 runs in the 16th one with 3 fours. Finch reached his fifty with another four, he hit the first six of the innings in the 22nd over and kept on punishing the rival bowlers at will. Shaun Marsh reached his half century in the 29th over with 3 fours and Aaron Finch plundered his first ODI hundred in the 32nd one. The latter got 4 fours in the 35th over and Marsh dispatched 2 sixes in the following one. The first wicket partnership was broken at 246 in 38.2 overs when Aaron Finch was caught by Freddie Coleman off Majid Haq for 148 from 116 mere balls with 7 towering sixes and 16 fours. Shane Watson walked in next and got into the stream right away by hitting 3 boundaries in the 42nd over. Shaun Marsh thrashed his third ODI century with a four and kept on showering the boundaries at will as the score went past the three hundred mark in the 45th one. He was finally caught by Gordon Goudie off Iain Wardlaw for 151 from 149 deliveries comprising 5 giant sixes and 16 fours. Shane Watson was gone in an identical fashion by the same duo for 37 as the Aussies powered 362 with seven wickets intact after 50 overs. Scotland went down by two wickets at just two runs while losing their openers and Preston Mommsen became the third victim at 27 in 11.1 overs. Calum MacLeod and Matt Machan tried to consolidate the innings as the latter was dropped by the Australian Captain, Michael Clarke, off Fawad Ahmed at 25. They crawled to 69 in 20.4 overs as Machan lost his wicket for 39 off 59 with 2 fours. The Australian bowlers made a big dent in the rival batting by taking frequent wickets and the home side was struggling at 7-109 in 34.3 overs. Majid Haq and Gordon Goudie associated in the park next and the latter hit 2 sixes and even fours in the coming overs. 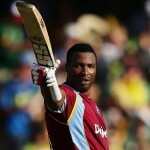 Haq added 3 fours in the process and was the 8th batsman who went back to the dressing room for 25. Goudie scored 23 and the entire Scottish team was bowled out for 162 in 43.5 overs. Mitchell Johnson was the star performer with four wickets, James Faulkner held two whereas Clint McKay, Adam Voges and Fawad Ahmed shared one wicket each. 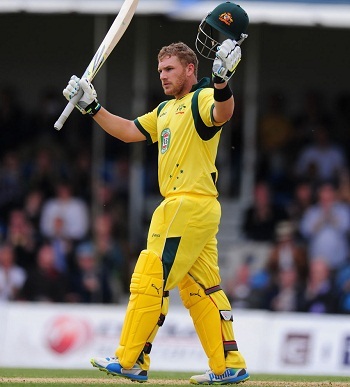 Australia clinched the only One Day International against the hosts Scotland by a huge margin of 200 runs.